Meet Christopher Moltisanti (Michael Imperioli in the real life), a nephew to Anthony Soprano, the "retired" crime boss from the television. Chris is on a pastry run in North Jersey, circa Season 1 of HBO's "The Sopranos." He is about to shoot a young baker in the foot. See, Dougie, the baker, allowed Gino, a customer who was known to him, to place an order ("two Neopolitan loaves") ahead of Christopher. Chris, of course, did not care much for this. And so the piece. And then the pop. I mention this because, in matters of fine Italian pastry, it is a sacred moment when one man (Uncle Tony in this case) calls upon another (young Chris) to "get some sfogliatelle" for the guys. Many times I myself have been called to such a mission. And though incidents occurred (stories for another time perhaps), I never popped anybody. In this I consider myself fortunate. For, confronted with the same disrespect as Dougie's while on una missione di sfogliatelle, I, like Chris, may have acted ingloriously. I am devoted to this pastry in an extraordinary way. Why, I often wonder, isn't everybody? This is the perfect pastry. Sweet, moist, magnificent ricotta and candied fruit on the inside. Crisp, flaky layers of thin, perfect pastry shell outside. What more could you possibly want from life? I came to Maine fifteen years back, and by Week Two had become inconsolable: Not a sfogliatelle in sight. Some weekends I'd drive four hours to and from Boston, allegedly to do "city things" but in fact to prowl the North End to feed my addiction. Once I discovered myself cold, alone and packing eleven -- eleven -- partially eaten sfogliatelle. They were in as many little white paper bags and the bags were inside the pockets of the winter coat I was sporting. I'd spent two hours wandering the streets, buying and sampling a pastry specimen wherever there was a pastry specimen for me to buy and to sample. It was snowing. I may have failed to mention this. Months later an intrepid baker (from away as they say in Maine) opened a shop on India Street here in Portland and to my shock had decided to bring here my beloved sfogliatelle. Not a bad one either. To make certain he kept on making it I bought up nearly every one he baked. I gave away, or fed to birds and other wildlife, probably ten times what I consumed. For months this went on, until one day, not surprisingly, baker and bakery were no more. And so again I mourned. I am not well. I know this. Now another baker here in town has committed to making my sfogliatelle. It is a fine one too (see "Sweet" under "Local Faves" at right), and is made, coincidentally, not a hundred feet from where the last guy tried. I do not bulk purchase them any longer, so either he will keep making the pastries because Mainers enjoy them or he won't because they don't. I'm like Dougie the baker. Martin Scorsese's "Goodfellas," 1990: Tommy DeVito (Joe Pesci) pops Michael "Spider" Gianco (Michael Imperioli) in the foot for failing to get him a drink. 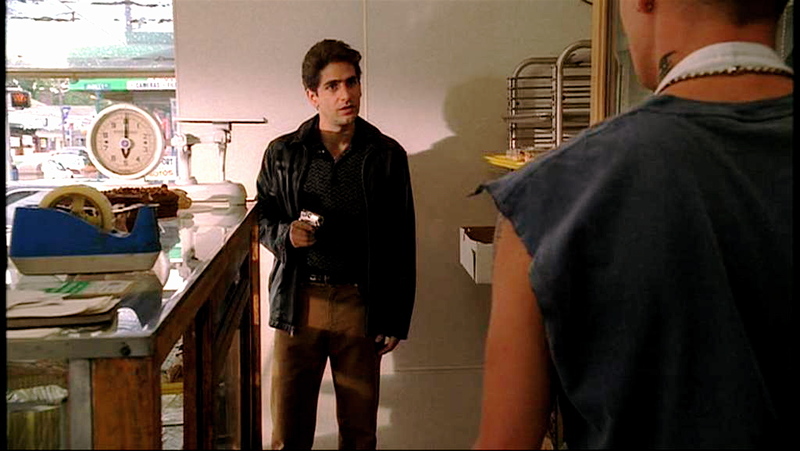 David Chase's "The Sopranos," Episode 8, "The Legend of Tennessee Moltisanti," 1999: Spider gets his revenge. "Gino," who reappeared as "Vito" in Season 2, hides out in New Hampshire later on in the HBO series. Looks like he could use a good pastry. Cannot get them in MN. And gee, I thought you were going to bake it yourself and post a recipe. I'm too afraid of the layers of pastry. Brings back memories of carboard boxes with red and white twine..
Michael grew up next door with my uncle (Rocky) in Mt. Vernon. They used to walk to school together when they were very young. He showned me his restaraunt last time i was there. Well, for one thing, it's hard to pronounce swigelele or whatever, so I hardly ever order that pastry. And, while a good one is tasty, most examples are too dry with some weird disgusting "creme" filling studded with candy mascarading as citron. Claudia, I aggree with you. I thought there was going to be some recipe, not just nostalgic fetishizing. How come you never bake, Mr. M? Claudia: I did once bake it myself. That's why I don't any longer. THS: Regarding the "weird disgusting" sfogliatelle you've sampled, I suggest that you not purchase them at the "weird disgusting" establishments I know you to frequent. We will all worry about you a lot less. Next time you visit Coluccio's in Brooklyn bring a cooler filled with dry ice. He sells frozen sfogliatelle that you bake in your own oven. Both Mini and full size! Medigans! What the hell do they know!!?? This is the pastry of the Gods! I too did the same thing on my last trip to NY. 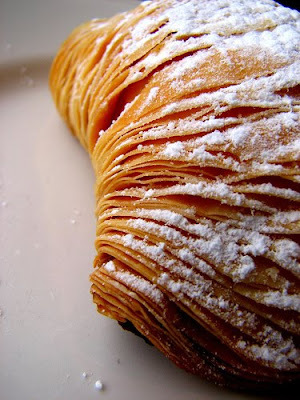 I wandered the streets of Astoria in freezing temperatures in search of a good sfogliotelle! I bought samples from the sadly few remaining Italian bakeries left in what was once an Italian stronghold. My favorite bakery of all time was Ciazzo on Broadway in Astoria / Long Island City. Their sfogliotelle were absolute perfection! They were one of the few bakeries that made them without those God awful candied fruit. Sadly they closed as many places do, the father died and the kids didn't want to be bakers, and so Ciazzo closed. I've been on a quest for a replacement ever since. I'm living in LA now and would love suggestions on where to find my all time favorite pastry. It's hard enough to find them fresh here ( lots of frozen imports) but everyplace seems to have the terrible candied fruit ( even a little changes the flavor) not to mention chewy crust and dry ricotta insides. Anyone have any suggestions or favorites? Sadly, I can't help you with LA pastries, but hopefully somebody else will. The best sfogliatelle guy in Brooklyn (Monaco's in Bay Ridge) recently closed. Don't get me started. As for candied fruit, I'm afraid we'll have to disagree on this point, as I myself am a fan. Mr. Meatball, my mom is from brooklyn, I was born and raised on sfogliatelle and it is also my favorite pastry. We tried making them ourselves, we even made our own candied orange peel. They turned out pretty good if I do say so myself. You should try making them! Its a good winter challenge and the way God intended us to eat the, warm! I can send you the recipe with our notes if you want to give it a try. Merry Christmas!